Taken with a Calumet CC400, 165mm/6.3 Caltar, 1/15s shot onto 4×5 Ilford 400 film. Self developed in Kodak Tri-Max developer for 10 1/2 minutes. Scanned and digitally retouched and developed. This is portrait I made of one of my favorite teachers. Part Bible teacher, part English teacher, part Social Sciences teacher, part preacher, he does a bit of everything. I have a lot of respect and admiration for this man and thankfulness for all he’s taught me. However, the inspiration of this portrait came from his constant habit of leaving the blinds of his second story classroom open and the lights off, meaning that almost all of his classes were taught in this fantastic window light. So, during the occasional boring moments of his classes I’d constantly think about how good light this was for a portrait: the light flooded in and bounced off the faux tile floor and filled the room very evenly and nicely. This was shot with the camera about stomach height and significant front fall to eliminate excessive headroom. I didn’t like the look that a lower position and slight front rise gave. One of my favorite things about view cameras is their ability to reproduce very natural looking perspectives. I wish I’d taken a comparison shot of similar composition with a standard DSLR but I feel satisfied with the strong vertical lines in this composition. I believe it helps emphasize the subject (he isn’t particularly tall). Something that further adds to this effect I see as I study the image is the omission of the bottom of the podium. This was more a result of inattentiveness while shooting; I originally envisioned the image to include more empty floor in front of the subject, however I very much like the effect here. Metering this scene gave me a bit of trouble. I have a Weston V meter and used it to roughly measure the reflected light off of the subject’s face. I got about one light level difference between the subject’s face and the background. I was hoping the walls would come across as a bit darker, but without a proper spot meter I left things up to chance a bit and metered for the subject’s face. The tripod I shoot with is less than sturdy and the camera shakes a bit. With no cable release, I have to use the timed release on the shutter to give the camera time to stabilize after starting the shutter release. I instructed the subject to square his body to the podium turn his face slightly off center and look at me, I was standing slightly above the camera. The film was developed in Kodak Tri-X for roughly 10 minutes, with 10 second agitation at the top of every minute. It was then scanned and digitally processed. 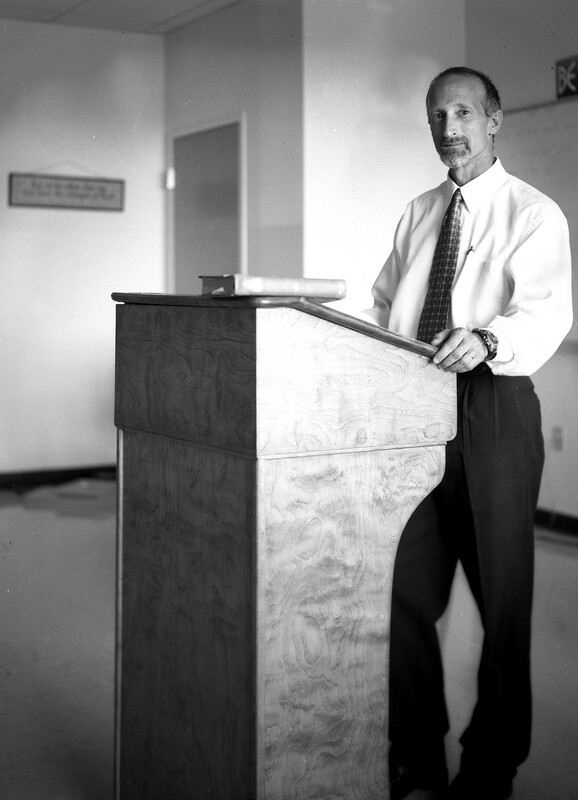 The scan was darkened to elicit the texture of the podium, remove detail in the subject’s pants and to further emphasize the bright white on the subject’s shoulder. There were a few things I should’ve done to improve this shot. Brought the subject closer to the window to increase light on the subject and shortened exposure time in order to maintain value of the subject while darkening the background. I don’t know if moving the subject closer to the window would’ve had a profound effect. I didn’t have much time to explore the effect as the teacher graciously gave me a few minutes after school to do a portrait and I didn’t want to use too much of his time. Moved a few of the things in the frame. There was some stuff on the ground to the left of the podium and I wish I’d recomposed the shot in order to avoid including the bit of poster in the upper right of the frame. I wish the lettering on the Bible was visible. It was a light leather bound Bible with gold lettering on the spine. I thought it would come across a bit darker, but it ended up completely over-exposed. In general I was very happy with this picture. It was the first picture with my large format camera that I was really happy with and the second one that I developed, so technically I considered it a success. However, what’s more, I was very pleased with the subject and the composition as a portrait. What’s more, I felt like its strength lies in the portrayal of the subject’s personality. Although a portrait with this strength will be more meaningful to someone who knows the subject, I think a decent portrait gives the viewer a glimpse into the life and personality of its subject. Nick, thanks for the kind words. I would have gone with “cranky” and “short” for the description. Reading about the process you went through gives this portrait great meaning for me.